Request evaluation key for i-Know Moulding. Welcome to the registration area of CCIM online. Registration of i-Know Moulding is FREE and allows you to use the software for 30 days. You need to register with your Evaluation ID, which is the unique number that is displayed when you start i-Know Moulding. 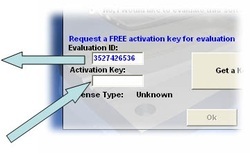 After completion of the form above, you will be send an Activation Key by email. You need to enter this key in i-Know Moulding at the first use. After this the software is registered and ready to use. Have fun exploring i-Know Moulding. Please use the instruction videos to get started.